It has come to the notice of Family Writers Press (FWP) of Indigenous People of Biafra (IPOB) on the recent propaganda mechanisms of All Progressive Congress (APC) in which they made a publication of delusion to Nigerians in general and Biafrans in particular and other auxiliary media blackmails targeted against Mazi Nnamdi Kanu the supreme leader of IPOB, whose bail conditions granted to him barred him from making press statement or interviews for now, this situation is making some Biafrans to begin to doubt Mazi Nnamdi Kanu's stance on Biafra restoration struggle because Nnamdi Kanu has not openly issued press statement to counter the media blackmail orchestrated by APC Nigeria government. Family Writers Press (FWP) eagle-eye journalists which are in every part of Biafraland and beyond are bringing serious reports on the news desk of Family Writers that the malicious publications of APC propaganda machine and other auxiliary publications of brown envelop Nigeria media houses has done a serious damage to the psyche of gullible Biafrans on the true position of Mazi Nnamdi Kanu on Biafra restoration. However, Family Writers Press (FWP) a trusted and dependable Biafra media outlet now, before, during and after the unlawful arrest and detention of Mazi Nnamdi Kanu is by this press release quashing and trashing all malicious and deceitful publications against Mazi Nnamdi Kanu, which has said or will later say that he (Nnamdi Kanu) is dumping Biafra restoration for politics in Nigeria. Mazi Nnamdi Kanu who nearly sacrificed his life for Biafra restoration when Nigeria DSS arrested him and threatened to kill him if he refused to denounce Biafra, but chose to die than to denounce Biafra, is not ready to denounce Biafra till tomorrow not even now when he has invariably regained his freedom. Family Writers Press is making Biafrans to know that they should not be ignorant of the fact that such baseless blackmails will come from Nigerian government which has lost new ideas of what to use next as tools of dissuading the Biafrans in their support to Nnamdi Kanu in restoration of Biafra, because there is no circumstance which they have not used in deceiving the public in the past on what Nnamdi Kanu stand for. However, as Nigerian government failed woefully when they used Vanguard Newspaper to fabricate the lies of RE-IPOB and TR-IPOB in conjunction with MEND and Charles Okah of Kuje prison against Mazi Nnamdi Kanu, so Nigerian government is still bound to fail once again. It is upon this ground that Family Writers Press is calling on Biafrans all over the world in general and Biafrans residing in Biafraland in particular to as a matter of urgency eschew listening to Nigeria brown envelop media outlets of shame which only deceive their Nigerian audience but to make Biafra media outlets such as Radio Biafra, Biafra TV, Family Writers Press, Biafra Herald, Biafra Post, Biafra Times and Biafra Telegraph their destination of news hunting or risk being deceived by media delusions which Nigeria government always pay hugely to make such publications. If you disconnect yourself from Biafra media outlets, you have intentionally made yourself intellectually dwarf who is expected to be tossed about by all winds of media delusions. Family Writers Press is categorically making Biafrans to know that Nnamdi Kanu is more committed to Biafra restoration now than even in October 2015 when he was unlawfully arrested and detained by DSS. The fact that Mazi Nnamdi Kanu has not spoken publicly to address Biafrans is in keeping to the court read out bail conditions which stipulated that he will not issue press statement for now but that does not change his position on Biafra. Family Writers also noticed that some gullible Biafrans and some mischievous Nigerians are asking that "if Nnamdi Kanu has shifted ground in Biafra restoration, why did he accept such bail conditions"? Family Writers is by this press release putting the record straight to the world that Nnamdi Kanu can never capitulate or shift ground in restoring Biafra. Nnamdi Kanu is a man who believes in the principle of natural justice and cannot join Gen Buhari of Nigeria in disobeying court verdicts. That was why after legal consideration he decides not to reject the court bail even with the obnoxious conditions, and now that he has signed his bail, it will be suicidal in the realm of justice for Nnamdi Kanu to disobey court verdict he accepted. Please Biafrans, make no mistake about it, disobedience to court orders is part of what kept President Buhari of Nigeria in the sorry conditions he found himself today. 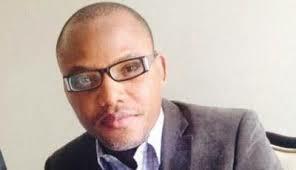 Nnamdi Kanu does not want to join Gen Buhari as stubborn grass-hopper disobeying court. Conclusively, Family Writers want to assure Biafrans that Nnamdi Kanu is seriously making diplomatic moves towards Biafra restoration off the media and need the support of all Biafrans. God bless Biafrans!